The Trinity Psalter Hymnal has now been published. Please note that the information on this page is not the most current update on the songbook. Ordering information will be added in the coming months. The URC is currently working on producing its own Psalter Hymnal. “But,” you might exclaim, “the URC already has a Psalter Hymnal! Doesn’t it?” The answer is both yes and no. A large number of the original congregations of the United Reformed Churches in North America had emerged from the much larger Christian Reformed Church (CRC). As a tiny new federation, the URC had no resources to produce its own hymnbook right away, and additionally, most of their congregations were already using the CRC’s 1959/1976 Psalter Hymnal. This is the hymnbook the denomination has unofficially used until now. But from the beginning, the URC realized that it could not use the CRC’s Psalter Hymnal forever. First of all, it was out of print; and second, a songbook unique to the URC would be necessary to foster further unity among the congregations. So very early on, the URC decided to at least start the process of creating its own songbook. At the request of Synod 1997, a Psalter Hymnal committee was formed. Since 1999 this committee has been faithfully working on the task of compiling and producing a new Psalter Hymnal for the URC. Despite these road-bumps, the committee received a great deal of helpful critiques from the various congregations and classes of the URC in the summer and fall of 2011. Meanwhile, the Psalter Hymnal Committee had also begun working on the psalm section of the new Psalter Hymnal. It was during this work that the joyful decision was made to merge the efforts of the United Reformed Churches and the Orthodox Presbyterian Church (OPC) and prepare a joint Psalter Hymnal. Not only would this be an excellent form of promoting unity with a closely related sister denomination, but it would also make the work for both churches easier, since the OPC had already completed a significant amount of work on the psalm settings and the URC had completed its Hymn Proposal. An added benefit would be that the end result could have a broader impact, not just on the URC and OPC, but on Reformed churches worldwide. The decision to merge efforts was finalized at Synod Nyack of the URCNA on June 13, 2012. Next came the intensive process of forming a joint Psalm Proposal that would combine the highlights of both denominations’ psalm-singing traditions with a new collection of beautiful and Biblically-sound selections. The website www.psalterhymnal.org was created to house digital versions of the songs slated for inclusion, and interested URC and OPC members were invited to send feedback to their denominations’ Songbook Committees through the end of 2013. 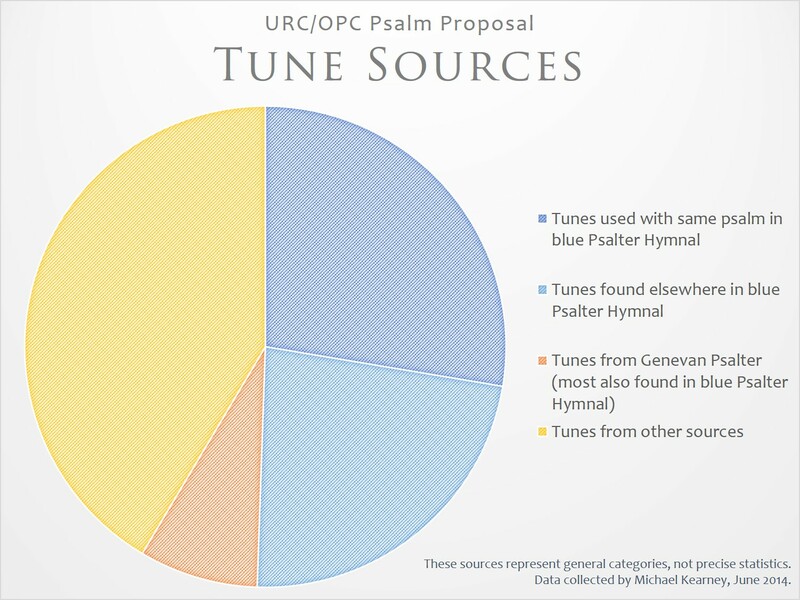 In June 2014 the URCNA’s synod unanimously (and the OPC’s General Assembly later overwhelmingly) approved the psalm section of the proposed Psalter Hymnal. The vote to move forward showed a recognition of the quantity and the quality of the work that has already been done on the new Psalter Hymnal, and perhaps too a realization that the time has come to finish this project. The new collaboration with the OPC, combined with the extensive feedback received regarding the first Hymn Proposal, prompted the Psalter Hymnal Committees to prepare a second collection of hymns. In March 2015 the committees released the titles (and later the sheet music) of 428 songs to be included in this second Hymn Proposal. After receiving feedback from church members, the committees presented the revised collection to the URC’s synod and the OPC’s General Assembly in 2016. Both bodies voted to adopt the new songbook with thanks for the extensive work of the committee members on the project, which has been dubbed the Trinity Psalter Hymnal. The denominations have agreed to publish a single edition of the Trinity Psalter Hymnal which will include psalms, hymns, the ecumenical creeds, the Three Forms of Unity, and the Westminster Standards. In addition, each denomination will produce a separate booklet containing its specific liturgical forms (unlike the CRC editions of the Psalter Hymnal that contained the liturgical forms and church order after the confessions). Lord willing, the Trinity Psalter Hymnal of the URC and OPC could be in our hands by as early as 2017. Until then, we look forward to the day when these likeminded denominations successfully produce a unique songbook for faithful Reformed congregations everywhere. 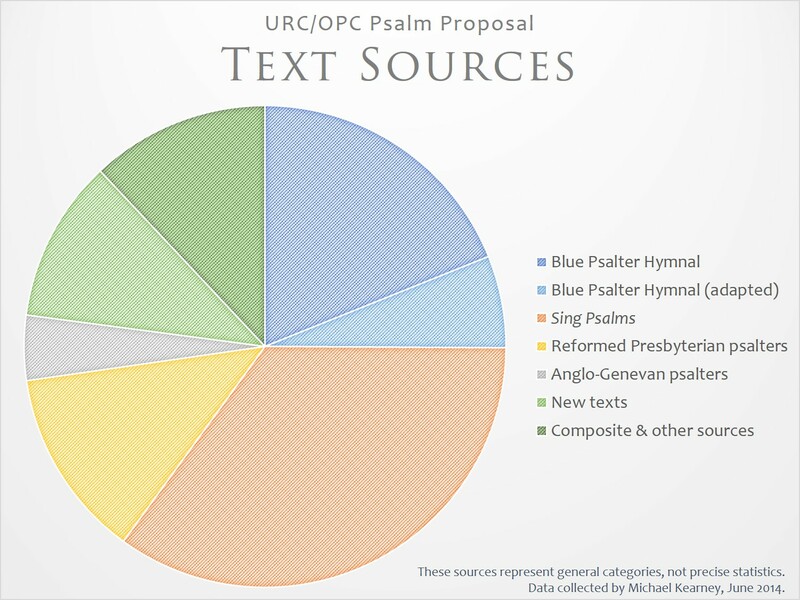 PsalterHymnal.org, the online home of the project, contains digital files for each of the settings in the Psalm Proposal. The collection is protected, but you can obtain the password by following the directions on the site. “Principles and Guidelines” is an excerpt from my report on the URC Hymn Proposal. It includes the synodically-approved guidelines for selecting church music, as well as some extra principles outlined by the musicians at West Sayville URC. The Psalter Hymnal area of the URCNA website includes several reports and other information about the work of the Psalter Hymnal Committee. A list of articles regarding the URC/OPC Psalter Hymnal project can be found here. Thank you, Michael. This is an accurate and fair summary of where our committee is at in the process. I would like to learn about The Reformed Church in The Netherlands. Do you have any sites that you could steer me towards. Is it known how much overlap there will be between the upcoming Trinity Psalter and the CRC blue psalter hymnal insofar as music for the psalms goes? Regardless, I’m excited to hear about this project! Glad I found this blog. *Though maybe not for much longer; see my blog (and my sister’s, which I link to there) for why. To put it succinctly, in just three words: clergy killing, corruption. Personally I’m done with the CRC forever, even if my father’s name is cleared. As you can see, just over half of the tunes in the psalm section of the new Trinity Psalter Hymnal are from the blue book. Evidently the editors feel that a good number of the tunes are still singable, and I agree! Your second hypothesis (“the ones that aren’t are such stinkers that they cast a pall over the corpus as a whole”) seems closer to the truth. Most of the very difficult tunes are from the Genevan/Dutch psalter, and some of those sound very foreign to our modern American ears (though they’re not “stinkers,” just culturally different). Some have enduring familiarity, too–you might think of the tune for Psalm 42, for instance, or the tune for the Doxology, “Praise God from Whom All Blessings Flow,” both of which come from the Genevan Psalter. Even in the blue Psalter Hymnal, those tunes are the minority. And I think it’s fair to say there will be a significant number of unfamiliar tunes in the new book as well. But “unsingable” sounds like broadbrushing to me! Hope that helps, and glad you’re excited about the new book. When is the projected release date? The latest estimate I’ve heard is sometime in 2018. Thanks for commenting! Michael, might you have a PDF list or Word doc of the included psalms, hymns, etc? The username “psalter” and password “hymnal” is no longer working on psalterhymnal.org. Would the two Psalter Hymnal Committees perhaps consider compiling a complete set of CDs with organ accompaniment for the Trinity Psalter Hymnal (all 575 songs)? This would be a wonderful idea and you are not the first to suggest it. I have passed it on to the editors of the songbook for their consideration. are there currently any sample recordings of the psalms and/or hymns? We are exploring a hymnal change and would love to be able to hear the songs as intended. You may also be interested in Ligon Duncan’s recent review of the Trinity Psalter Hymnal. By searching on the individual song titles, you can probably find recordings for most of the songs he mentions. Will there be an electronic Trinity Psalter Hymnal available for purchase (similar to the RPCNA’s wonderful “The Book of Psalms for Worship”)? If so, do you have the contact info of those who know its progress? The Trinity Psalter Hymnal Joint Venture Board is coordinating plans to release an electronic version of the new book. URC Psalmody will post about the progress of this project as more news becomes available.